Oklahoma City "City Hall" is located at 200 North Walker Street, Oklahoma City, OK 73102; phone: 405-297-2345. Photo: George Gershon House, ca. 1911, 901 Northwest 17th Street, Oklahoma City, OK. 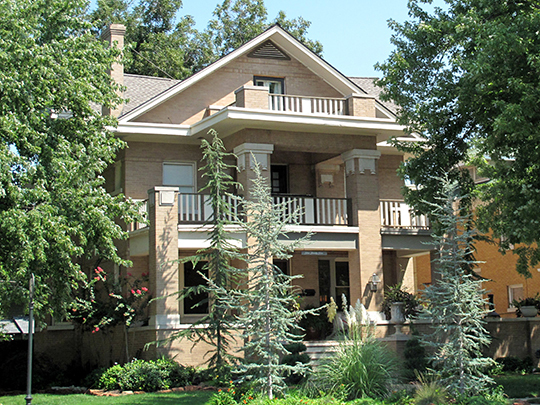 The house is a contributing property to the Mesta Park Historic District. The Historic District was listed on the National Register of Historic Places in 1983. Photographed by User: Matthew Rutlege (own work), 2009, [cc-by-2.0 (creativecommons.org/licenses/by/2.0)], via Wikimedia Commons, accessed September, 2013. Oklahoma City was established as a result of the 1889 Land Run with an initial population of 4,138, which by 1910, three years after Statehood, had risen to 64,205. Extending in all four directions from the downtown, residential neighborhoods quickly developed. Toward the northeast, on the east side of the Santa Fe Railroad tracks, the Maywood Addition developed with stately Victorian residences. South of the downtown area, across the North Canadian River, the Capitol Hill neighborhood was established. And, northwest of downtown Oklahoma City, following the progress of the streetcar lines, were the majority of Oklahoma City's middle and upper class neighborhoods. By the mid-1910's, frame and brick homes lined the streets of the city and, while many were located south of Northwest 10th, there were some as far north as Northwest 23rd. The Oklahoma City economy boomed during the 1920's and neighborhoods continued to develop rapidly with almost every street from the centrally located downtown north to North 36th and south to South 29th completely filled with homes of varying sizes. These neighborhoods represent the residential architectural styles of the mid-1910's and 1920's. These styles include Bungalow, Colonial Revival, Prairie School, Tudor Revival, and many others typical of the two decades. The discovery of the Oklahoma City Oil Field in 1928 resulted in one final economic boom before the effects of the Great Depression reached the city. This economy encouraged developers such as G.A. Nichols to continue to develop parcels of land and build and sell houses. Crown Heights was the largest middle class neighborhood platted from 1928 until after World War II. Maryjo Meacham, Kerri Robinett and John R. Calhoun, City of Oklahoma City, Crown Heights Historic District, nomination document, 1995, National Park Service, National Register of Historic Places, Washington, D.C.